Nox Player 6 is an Android emulator for your PC with convenient Google Play access. You can now download Nox Player 6 on your Windows or Mac computer to run Android games. Nox Player is a free Android emulator that is designed specifically to run Android apps and games from the Google Play Store on a desktop environment (PC). As Android games continue to get better, many users crave to have the same gaming experience as on a dedicated Android smartphone but on a larger screen. Sure you can extend the display of your smartphone or tablet through a simple HDMI connection but then you have to worry about battery life and controls. 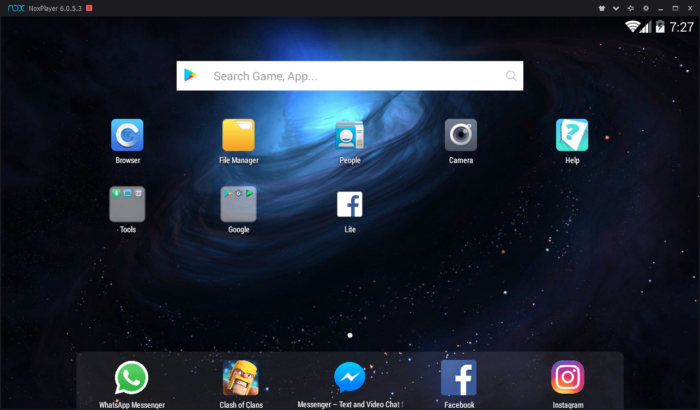 The best solution to play Android games on a much larger screen is to have an emulator like the Nox Player 6 (or BlueStacks) installed on your computer. The guide below will take you through the process of how you can download Nox Player 6 on your PC and what are the best features that this emulator offers. Nox Player 6 works by emulating an Android environment directly on your computer and then utilizing the Google Play Store to download apps and games. This way, you don’t have to worry about configurations or need any special technical insight to have Android games running on your computer. The best part is, this emulator is available for two of the most popular platforms – Windows and macOS. For developers, Android has its own emulator which lets you run different Android versions on your computer. But the problem with that solution is the lengthy process of installation and also the sheer amount of data you have to download in order to get it running. What sets Nox Player 6 apart from other such attempts are the features. Highlights include, full gamepad support, multi-instances and faster running times. Further, the compatibility of Nox Player 6 is not to be ignored. It works on x86 and x64 architecture machines while also supporting both Intel and AMD processors. Also, Nox Player 6 doesn’t end at games, you can easily install other apps from the Google Play Store. Adding even more to it, there is an option of installing APKs directly which is a big plus. To explore more, you can download Nox Player 6 from the links below and try it for yourself. We love it, and this is going to be a recommended emulator for playing Android games on PC from us! It is a huge thing that many other emulators lack. Often you need to find APK’s to download and that defeats the entire purpose of an emulator. We can’t tell you how many times we have downloaded and installed an emulator just to look at and wonder why Google Play access isn’t right there. NoxPlayer takes care of this annoyance by making Google Play the core of its functionality. It works perfectly. So, if you are looking to install something and run apps from Google, just like your phone, then this is most likely the one you want. It does work excellently. Some users have been getting an error message about incompatible CPU’s that appears only to show up if you have a single core CPU.